ZOTAC has announced the updated VR GO Backpack with a sleeker design, more user friendly functionality and improved VR performance. Their first VR backpack was announced at the Computex 2016. The new VR GO backpack is lighter, more accessible, and more durable. This backpack PC literally just sits on your back using straps. All your VR cables go into the PC so there’s nothing on the floor to impede your movement. The PC has its own removable battery pack that can power itself. Inside the small chassis sits an NVIDIA GeForce GTX 1070 graphics card, nice I/O capabilities, a quad-core CPU and a battery that’s hot swappable. The new VR Go is able to be used as a normal PC when not gaming on the go. The challenge with the SFF systems is always cooling, especially when they’ve desktop grade graphics cards inside. Other connectivity options include three more USB 3.0 ports, two more HDMI outputs, SD card reader, dual Gigabit Ethernet, two DisplayPort outputs, and a pair of 3.5mm headphone inputs. Hardware includes an Intel Core i7 processor, the GTX 170 graphics card, a M.2 SSD, WiFi, and dual DDR4 SODIMMS. A bay for a single 2.5-inch HDD or SSD is available. ZOTAC’s VR GO system is not the first backpack-type PC developed by the company. At the Computex 2016 the hardware manufacturer demonstrated a wearable sys, but that was largely a prototype and still in the early design stage. 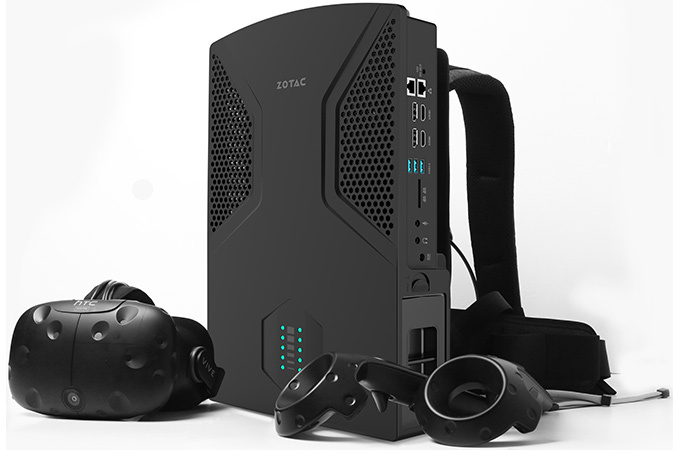 By contrast, the ZOTAC VR GO looks like a commercial product. ZOTAC doesn’t specify the exact availability timeframe for its VR GO backpack PC other than Q4 2016 as well as its estimated price. We expect to see it at CES in this January for sure.